What a great idea for cupcakes! This looks delicious! 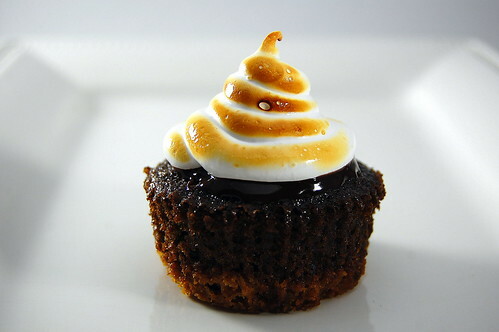 I had my first smores cupcake at one of my favorite dessert places, Chikalicious in NYC. I can't wait to try this recipe! I have a question, what happened to the marshmallow in the marshmallow frosting? Is it not required? Thanks for sharing the recipe by the way! those look so great! I love toasted marshmallow! Those look so good! I love s'mores! These look delicious, I'm actually making an adapted version of them tomorrow for my daughter's 2nd birthday (she's allergic to dairy and eggs so I'm using a vegan cupcake recipe for the base). I have a question about the frosting... it says to serve immediately because it hardens. How hard does it really become? I'd like to frost them before the party starts and not have to worry about it but want them to be yummy and still taste marshmallowy. Sure, they can be made ahead of time. 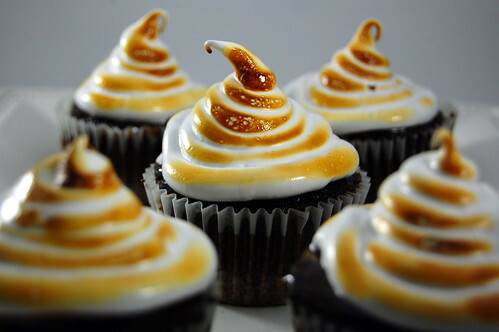 the biggest thing is to make sure you pipe the marshmallow immediately because it will be too hard/sticky to pipe onto the cupcake. I just made the chocolate cupcake base to go with peanut butter frosting and they were so great! The recipe halves beautifully too. Thanks!